Our Chair Chris Brindley receives MBE | Beth Tweddle Gymnastics (formerly Total Gymnastics) Cookies Policy. 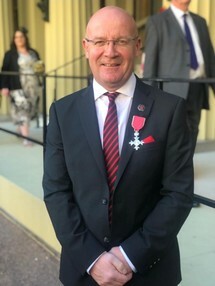 Chris Brindley, the Chair of Beth Tweddle Gymnastics' parent company - Sporting House - receives his MBE from HRH Prince William, Duke of Cambridge for his services to sport. Discussing the prestigious award, Chris said, "I am obviously delighted to receive such an honour from HRH Prince William for Services to Sport. I am also delighted to work with everyone at Sporting House knowing that together we make a positive difference to the lives of almost 20,000 children every week across swimming and gymnastics." Chris’s outstanding career includes the Chairmanship for GreaterSport Manchester for over 10 years. GreaterSport is one of the UK’s leading charities, which works with a range of Government Agencies and Local Authorities to deliver Sport and Physical Activity to the population of the North West. He is also a Non-Executive Director to the Rugby Football League. Chris has enjoyed an incredible business career in banking, including as former MD of Metro Bank. His experience, expertise – and undoubted passion for sport at any level – has played a major part in the development of Beth Tweddle Gymnastics, since he took over as Chair of Sporting House in 2015. Congratulations Chris – we are proud of you!